Majdanek, or KL Lublin, was a German concentration and extermination camp built and operated by the SS on the outskirts of the city of Lublin during the German occupation of Poland in World War II. Although initially purposed for forced labor rather than extermination, the camp was used to kill people on an industrial scale during Operation Reinhard, the German plan to murder all Jews within their own General Government territory of Poland. The camp, which operated from October 1, 1941, until July 22, 1944, was captured nearly intact, because the rapid advance of the Soviet Red Army during Operation Bagration prevented the SS from destroying most of its infrastructure, and the inept Deputy Camp Commandant Anton Thernes failed in his task of removing incriminating evidence of war crimes. Therefore, Majdanek became the first concentration camp discovered by Allied forces. Also known to the SS as Konzentrationslager (KL) Lublin, Majdanek remains the best-preserved Nazi concentration camp of the Holocaust. Standartenführer was a Nazi Party (NSDAP) paramilitary rank that was used in several NSDAP organizations, such as the SA, SS, NSKK and the NSFK. First founded as a title in 1925, in 1928 the rank became one of the first commissioned NSDAP ranks and was bestowed upon those SA and SS officers who commanded units known as Standarten which were regiment-sized formations of between three hundred and five hundred men. Otto Max Koegel was a Nazi officer who served as a commander at Lichtenburg, Ravensbrück, Majdanek and Flossenbürg concentration camps. Florstedt was investigated by SS Judge Georg Konrad Morgen and charged by the Schutzstaffel (SS) with embezzlement and arbitrary killing of prisoner witnesses. Florstedt was one of two Majdanek commandants put on trial by the SS in the course of the camp operation. He was charged with corruption (wholesale stealing from the Third Reich); he had access to valuables stolen from Holocaust victims killed at death camps of Belzec, Sobibor and Treblinka. These valuables were stored and processed at Majdanek. Georg Konrad Morgen was an SS judge and lawyer who investigated crimes committed in Nazi concentration camps. He rose to the rank of SS-Sturmbannführer (major). After the war, Morgen served as witness at several anti-Nazi trials and continued his legal career in Frankfurt. Martin Gottfried Weiss alternatively spelled Weiß was the commandant of the Dachau concentration camp in 1945 at the time of his arrest. He also served from April 1940 until September 1942 as the commandant of Neuengamme concentration camp, and later, from November 1943 until May 1944, as the fourth commandant of Majdanek concentration camp. He was executed for war crimes. ↑ "Konrad Morgen "The Bloodhound Judge", Investigating corruption within the SS". Holocaust Education & Archive Research Team. 2012. Retrieved 2013-04-23. ↑ Staff Writer (2006). "Lublin/Majdanek Concentration Camp: Conditions". Holocaust Encyclopedia . United States Holocaust Memorial Museum . Retrieved 2013-04-13. ↑ "Procesy zbrodniarzy (Trials of war criminals) 1946–1948". Wykaz sądzonych członków załogi KL Lublin/Majdanek. KL Lublin. Retrieved 2013-04-14. Karl-Otto Koch was a mid-ranking commander in the SS of Nazi Germany who was the first commandant of the Nazi concentration camps at Buchenwald and Sachsenhausen. From September 1941 until August 1942, he served as the first commandant of the Majdanek concentration camp in occupied Poland, stealing vast amounts of valuables and money from murdered Jews. His wife, Ilse Koch, also took part in the notorious crimes at Buchenwald and Majdanek. 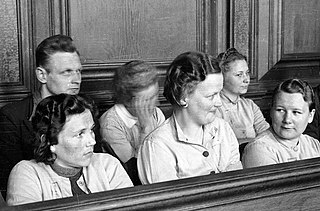 Hermine Braunsteiner Ryan was a female camp guard at Ravensbrück and Majdanek concentration camps, and the first Nazi war criminal to be extradited from the United States, to face trial in Germany. Braunsteiner was known to prisoners of Majdanek concentration camp as the "Stomping Mare" and was said to have whipped women to death, thrown children by their hair onto trucks that took them to their deaths in gas chambers, hanged young female prisoners and stomped an old woman to death with her jackboots. She was sentenced to life imprisonment by the District Court of Düsseldorf on April 30, 1981 but released on health grounds in 1996 before her death three years later. The Aktion Erntefest was a World War II mass shooting action carried out by the SS, the Order police, and the Ukrainian Sonderdienst formations in the General Government territory of occupied Poland. 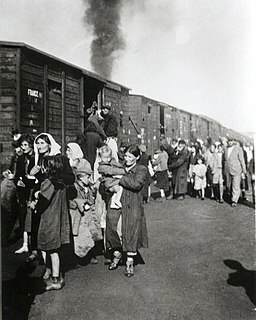 The operation aimed at extermination of Jews pressed into forced-labour at the camps of the Lublin reservation including Majdanek concentration camp and all its subcamps. It was closely linked with the liquidation of the ghetto in Lublin. Aktion Erntefest took place on November 3 and 4, 1943. On the orders of Christian Wirth and Jakob Sporrenberg, approximately 42,000–43,000 Polish Jews were killed simultaneously. Virtually the entire Jewish workforce was eliminated, thus concluding Operation Reinhard. Hermann Hackmann was a German war criminal, Nazi SS captain in two extermination camps during World War II. He was a roll call officer at KL Buchenwald, and lead guard in charge of the so-called protective custody at Majdanek concentration camp in German-occupied Poland. Described as a brutal man with a cynical sense of humour, Hackmann was tried three times. The first time, he was prosecuted for murder and sentenced to death by SS Judge Georg Konrad Morgen in connection with the Koch trial. Hackmann escaped punishment and was evacuated by the Gestapo. Erich Mußfeldt, was a German war criminal, an SS NCO who served in two extermination camps during World War II in occupied Poland - Auschwitz and Majdanek. He was arrested and charged by the Allies originally in 1946, then transferred to Poland where the full extent of his war crimes was revealed thanks to new evidence. He was retried by the Supreme National Tribunal at the Auschwitz Trial in Kraków, and found guilty of crimes against humanity. Muhsfeldt was sentenced to death by hanging in December 1947, and executed on 24 January 1948. The SS Court Main Office - one of the 12 SS main departments - was the legal department of the SS in Nazi Germany. It was responsible for formulating the laws and codes for the SS and various other groups of the police, conducting investigations and trials, as well as administering the SS and Police Courts and penal systems. 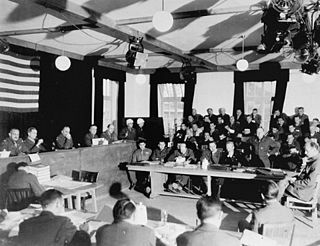 Stutthof trials were a series of war crime tribunals held in postwar Poland for the prosecution of Stutthof concentration camp staff and officials, responsible for the murder of up to 85,000 prisoners during the occupation of Poland by Nazi Germany in World War II. None of the Stutthof commandants were ever tried in Poland. SS-Sturmbannführer Max Pauly was sentenced to death in Germany but not for the crimes committed at Stutthof; only as the commandant of the Neuengamme concentration camp in Hamburg. Arnold Strippel was a German SS commander during the Nazi era and convicted criminal. As a member of the SS-Totenkopfverbände, while assigned to the Neuengamme concentration camp, he was given the task of murdering the victims of a tuberculosis medical experiment conducted by Kurt Heissmeyer. 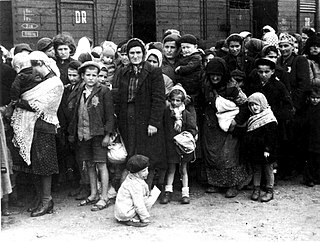 Else Lieschen Frida "Elsa" Ehrich was an SS guard at the Nazi concentration camps, including at Kraków-Płaszów and the Majdanek concentration camp during World War II. She was tried in Lublin, Poland at the Majdanek Trials and sentenced to death for war crimes. Ehrich was hanged on 26 October 1948. SS-Obersturmführer Anton Thernes was a Nazi German war criminal, deputy commandant of administration at the notorious Majdanek concentration camp on the outskirts of Lublin, Poland in World War II. He was tried at the Majdanek Trials and executed on 3 December 1944 along with five other war criminals near the gas chambers and the Majdanek crematorium. SS-Hauptsturmführer Wilhelm Gerstenmeier was a German member of the SS during World War II. 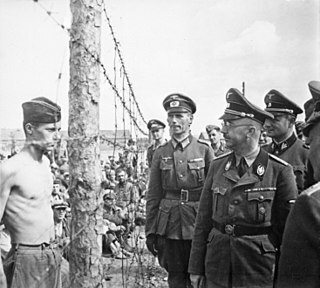 He was convicted of atrocities committed at the Majdanek concentration camp in occupied Poland and hanged for war crimes on the grounds of the camp in 1944. Hermine Böttcher was a female SS auxiliary guard at several concentration camps between 1942 and 1945.